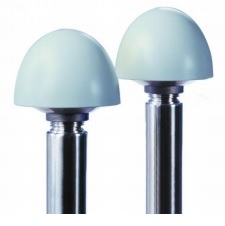 The Trimble® Bullet™ 360 timing antennas are designed specifically for the congested urban environments. In challenging urban environments the increased number of visible satellites will significantly improve the performance of GNSS receiver. The weatherproof housing is designed to withstand continuous exposure to shock, excessive vibration, extreme temperatures, water and sunlight. For added reliability, the antenna cable can be threaded through a pole mount to keep it safe from environmental damage.